It should have been the proudest moment of her life. Wai Wai Nu, a young woman from Myanmar, stood on the university podium with her law degree certificate in her hands. But there was a problem. "I said thank you and took a few steps and realised, this was not a degree. The certificate said: 'Go and enquire at office',” she said during a session at Davos. As a member of the Rohingya ethnic minority, her official ID card was no longer recognised, a roadblock to her getting other official documents. It was a bitter blow for a new graduate who had already endured more than most of us do in a lifetime. At the age of 18, she was imprisoned for seven years along with her family as the authoritarian regime of the time lashed out at her father, an opposition MP. She described life in a notorious prison as a tough "education" which left her determined to succeed and help the sort of women – many of them victims of abuse and poverty – she shared a cell with. An ID card would not get in her way. 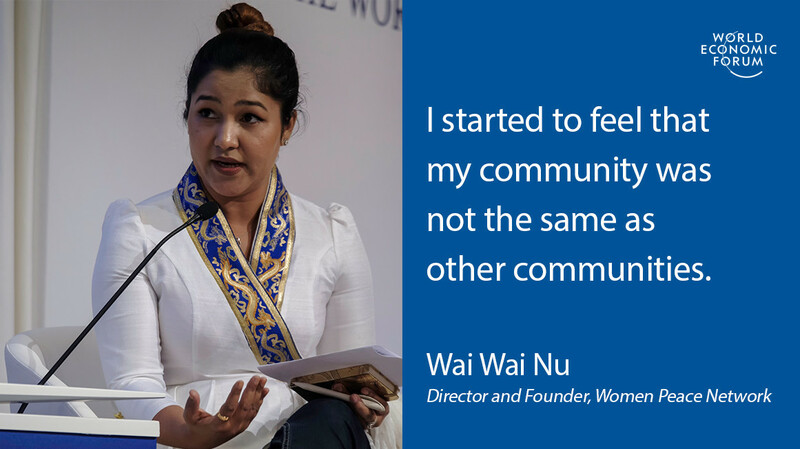 Wai Wai overcame the difficulties to found two NGOs, Women’s Peace Network-Arakan and Justice For Women, as well as launching an online project called #myfriend to share photos of Myanmar friendships that cross ethnic divides. Although raised in a relatively tolerant city, as a Rohingya Muslim with family in the Rakhine province, she had first-hand insights into the chilling spread of ethnic hatred. This systemic discrimination has now spilled over into what UNHCR calls the “world’s fastest growing refugee crisis and a major humanitarian emergency”. Peter Maurer, President of the International Committee of the Red Cross, deals first hand with the desperate consequences of ethnic tensions. Speaking at the same session, Fostering Inclusivity, he shared his insights on how hatred takes hold. “If you reduce a group to a single identity, it’s the biggest driver of violence,” he said.